Win a Free Conference Pass to eTail West! 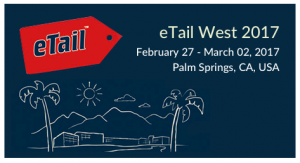 This month we are offering retail professionals the chance to win a free full conference pass to the industry conference eTail West 2017, February 27 – March 2, 2017 at the JW Marriott in Palm Springs, CA. eTail, launched in 1999, is the premiere multi-channel retail conference dedicated to supporting the growth of the retail industry through high-level networking and extensive thought leadership. eTail West was launched as part of the eTail Conference series to speak to the unique challenges facing retailers looking to grow their brand in the market. To enter simply go to the WMA Contest page and enter. Learn more about this leading industry conference here. January 11, 2017 | In Events, Interactive Briefing, Web Marketing Association | Comments Off on Win a Free Conference Pass to eTail West!